Over the weekend I took a trip down to Paengaroa (about 30km east of Tauranga) to visit some family. After travelling through Tauranga, the fastest option for getting there is via only the second of the government’s Roads of National Significance to have been fully completed, the Tauranga Eastern Link (TEL) – the first was the Victoria Park tunnel. This wasn’t the first time I’ve driven over the road and as with previous times, I was struck with the emptiness of it. So, I thought I’d look a little closer at it. It is also intended that eventually two additional interchanges along the route will be added, one roughly where the road turns away from being parallel with the coast to serve the continued residential growth in Papamoa (expected to be needed in about a decade) and the second for a proposed business park near the eastern end of the motorway. You can see the TEL to the right of the map below which is much straighter than old State Highway 2 through Te Puke which was rated as the second worst in the country for safety. As mentioned, the project was designated a road of national significance by the government in 2009 and one of the reasons for that was in this cabinet paper outlining why the route should be tolled. TEL has been specifically developed to generate economic growth within the Bay of Plenty region. The Western Bay of Plenty continues to be one of the fastest growing areas in New Zealand. The NZTA advises that TEL will contribute to economic growth by providing convenient, reliable access to areas of employment, and by improving access for freight to the Port of Tauranga and to new urban and industrial developments. Currently, TEL is prioritised 45th in the NZTA‘s 2009/2010 State Highway Plan. Based on this programming, construction would not begin for an estimated 5–7 years if it were funded entirely from the National Land Transport Fund (NLTF). The NZTA‘s view is that borrowing, supported by tolling, would allow construction to commence in 2010/11. This approach requires Cabinet approval. A similar approach has previously been used in relation to the Northern Gateway Toll Road (NGTR). At the opening of the road, Transport Minister Simon Bridges and then Prime Minister John Key praised the road as being a game changer for the Bay of Plenty. The new Tauranga Eastern Link has been described as a “game changer” that will bring the Bay closer together and “ensure economic growth”, Transport Minister Simon Bridges told dignitaries at its official opening yesterday. It was the “best road in New Zealand,” the largest in the Bay of Plenty and the most highly specced you could build, with four lanes, seven bridges and the biggest roundabout in the country – all completed five months ahead of schedule at $455 million, he said. 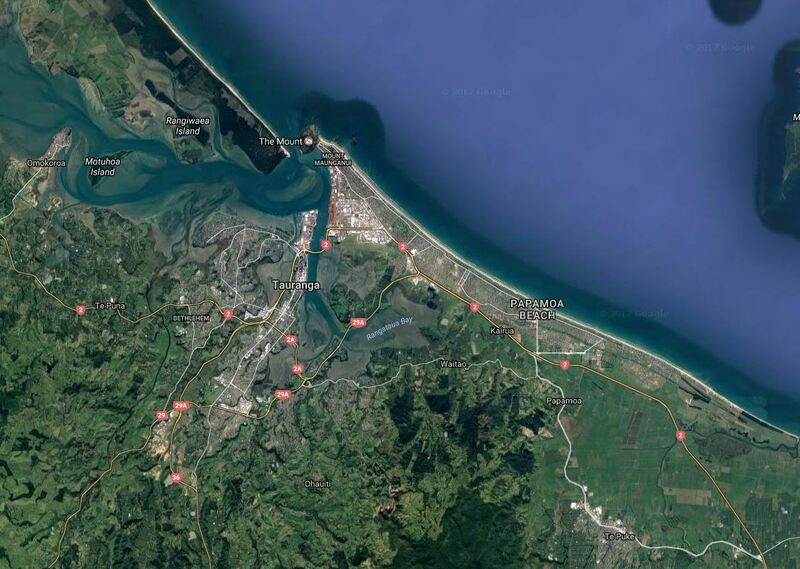 The 21km road, that heads towards the Port of Tauranga, would increase productivity and shave about 24 minutes off a return trip between Paengaroa and Te Maunga, creating quicker access for inter-regional freight to the Port of Tauranga and driving down costs. Prime Minister John Key echoed those sentiments and said the highway had been designed to open up the region. “This will help grow industry and jobs, improve safety and support economic development and growth. The most highly specced is another way of saying the road had been gold plated and it certainly feels that way to drive on it. 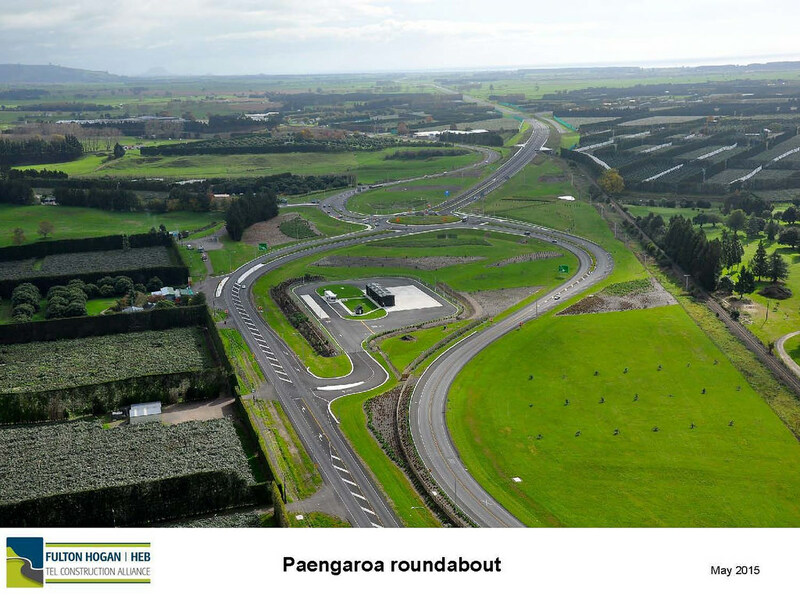 And Bridges isn’t kidding when he says it has the biggest roundabout, the whole interchange at the Paengaroa end is probably the most space hungry I’ve seen. But when it comes to just how useful it is to the economy, it appears to be more like a movie that never lives up to its hype. Historically most transport projects are paid for out of the National Land Transport fund but as quoted earlier, the NZTA, through the government, borrowed month to allow them to start the project sooner than otherwise would have been possible. the Cabinet paper referenced says they would borrow $137 million for the road. On top of that, interest would be capatalised to the loan and which had a potential range of $59-151 million. That $137 million would be paid for over 35 years by tolls – which are capped at $2 for light vehicles and $5 for heavy vehicles (in 2008 values), with only CPI increases allowed. Now of course servicing that debt relies heavily on there being enough traffic. The NZTA predicted that 8,600 vehicles would use the road daily in 2016 rising to 21,200 in 2031. It’s also worth pointing out that SH2 at Te Puke never saw traffic volumes reach 21,000 and in 2006 were just over 18k per day and they peaked a few years later at just over 19k per day. 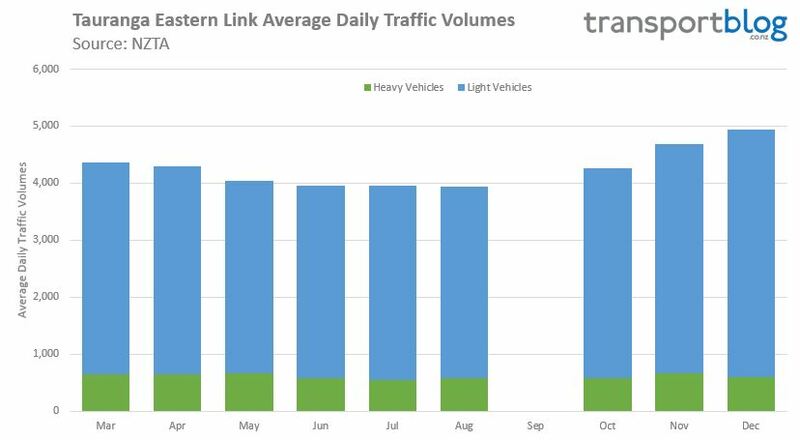 The monthly data from the NZTA only includes the TEL from March this year, ideally we’d have more results, but it shows traffic volumes are less than half of what was expected with an average of about 4200 using the road on a daily basis. Residential streets in Auckland move more people, plus in a lot less space. The results also show about 600 heavy vehicles using the road per day, only about a quarter of those using old road before TEL opened. Lower volumes also mean lower revenues to help pay off the loan. We can see the difference between heavy and light vehicles, we can estimate what revenue would be for each month. Over the nine months we can see in the graph above, I estimate the average amount that was collected was just under $320k per month. Even with low interest rates, that’s about half of what would be needed to pay back that $137m loan. Here’s some what the Cabinet Paper says about should this situation arise. One of the risks of any tolling proposal is that deviations from the traffic volumes forecast would have implications for revenue, and consequently on the ability of the project to repay the debt. To generate the traffic forecasts for this project the NZTA sought input from a third party, Beca Consultants. In the event that there is a shortfall in debt repayment on TEL due to lower than expected toll revenue, the NZTA will be responsible for meeting this debt through planned risk mitigation measures. I wonder at what point the NZTA push the panic button on this road. It is also probably a good example highlighting that people’s willingness to pay is often considerably lower than the perceived value of the time savings, which is important given how much importance time savings are given in project assessments. Is it too early to call this a white elephant yet and will anyone be held to account for the wildly inaccurate traffic modelling and assessment? And yet despite its issues, it’ll look like a sane investment next the proposed motorway between Warkworth and Wellsford. Update: it turns out the results the NZTA included in the data I used for this were only for one direction, not both directions like every other road in the dataset provided. I apologise for not picking this up. That’s the trucking indu$try you’re talking about. Not bloody likely! Cannot legally be done. Law requires a reasonable alternative route to remain. Rightly so. Tolls are double dipping and offer a ‘choice’. Exactly the same corrupt ‘business case’ was applied to justify our first toll road in Tauranga, Route K at 4.3 kms long, based on 7500 vehicles per day on opening in 2003. It secured 2000 per day, and 15 years on reached 7500. Wow great research into this Matt. What a scandalous waste of money these rural motorways are turning out to be. Great summation, however another twist has been added. Te Puke’s main street is now undergoing a major transformation and being narrowed to one lane. The inevitable log jam that this will create will eventually force drivers to use the TEL. If they won’t use this white elephant we shall use cunning and guile to make them. Well that’s a good thing. NZTA have a terrible record in cities of building the expensive new mega road, sold as a bypass, as ‘relieving local streets’ but doing nothing to make that real, just dumping the old route on the impoverished local authority with no funding to actually realise this major benefit of the duplicating investment. I was in the newly bypassed Cambridge last week, and there was work underway to squeeze the old four lane SH1 through town at one point. Which is good, as I was surprised at the volume of heavy traffic, including milk tankers, still rumbling through this pretty and prosperous town. Unfortunately with a roundabout, with no sign of bike lanes, despite the huge amount of spare road space and lots and lots of people on bikes. And I presume this is a local gov project. It will be interesting to see what happens in the kapiti coast given their new country motorway is untolled. The old sh1 looks dead, and is ridiculously wide for what it now does. lol as have traffic calming measures applied through urban areas as part of the steate highway revocation process that will see it transferred to a local Kapiti Coast District Council controlled road. Yes it is. A small charge will change driving behaviour. However it also shows that if we were to say toll AKL m’ways then the change in behaviour would be driving on local roads. Surely not the intended consequence. The charge will have to be global. On all routes. And, my friends, that will be an interesting thing to get through. What was the logic behind building this? I thought Nationals belief in the invisible hand of the free market and not picking winners would never have seen this built. An awful lot of dead money that could have done a lot of good eleswhere, not on roads either. It’s all about the Port. Auckland port is unionised and Tauranga isn’t. They have spent mega dollars on back road from Rotorua, Kaimais etc to get the freight to the port quicker and wipe Auckland off the map. This is absolutely all about the port. The road is in direct competition with rail for a number of routes, including in future unit trains out of Ruakura. Oh look, a shiny new road is currently being built to Ruakura. If what’s happening here is that we’re seeing the government lose a ton of money on subsidising truckies, we should at least be grateful for the transparency with which it’s been done. So instead of upgrading what is currently the most busy freight line in NZ, these idiots see it as far better that trucks carry more freight from the port. Again what is the illogic behind that move or is it yet again time to question who donates to who? A perfect description of our current government’s Roads of National Significance doctrine. Which is, after all, entirely circular; as in it roads are simply declared as nationally significant by being roads. It is a faith based, not evidence based doctrine, every new road is declared a ‘game changer’, yet they to meet their own modest targets, and demonstrably change no games. Patrick, while I 100% agree with the sentiment, I also strangely believe that these roads are game changes and are very much needed, even if the economics doesn’t stack up. But there needs to be an equivalent for public transport investment – even if it doesn’t stack up in a business case or whatever, there is no other option in my opinion to allow Auckland to grow any more than significant PT investment. game-changers? You mean in the sense that they’re playing games with billions of $$$? Care to expand on exactly how one defines a “game-changer”? If ‘game changer’ is a another term for cheating then this was certainly a game changer. Like when Maradona used his hand against England in 1986 or when the All Blacks lifted that Irish dude and dropped him on his head. A quite literal game changer, indeed. Except the Webb-Ellis story is BS. He never claimed he invented rugby, the whole story was just made up after he died. But that fact didn’t stop the rugby union naming their cup after him. You ‘believe’. Indeed. So does, government, MoT, Treasury, NZTA, apparently. Like you these institutions have faith regardless of the evidence… there’s a word for that. I do know that the Waikato expressway RONS will save me at least 30 minutes when driving to Napier, and once the speed limit is upped to 110km/hr I will save another 30 minutes. All of a sudden driving will be a reasonable option, I will save hundreds a year in flights. I doubt my flight savings are in the business case. Do you really believe we should have goat tracks joining all our cities forever just because no business case can justify anything better? Should we do business cases before we operate on people, or before we pay out welfare, etc? Jimbo – the money spend on said expressway will mean the remainder of the journey is less safe than it might otherwise be as it means there isn’t as much money to be spent on safety improvements on other roads, such as the Napier to Taupo road. I’m pretty sure personal travel time savings are accounted for in the BCR process. 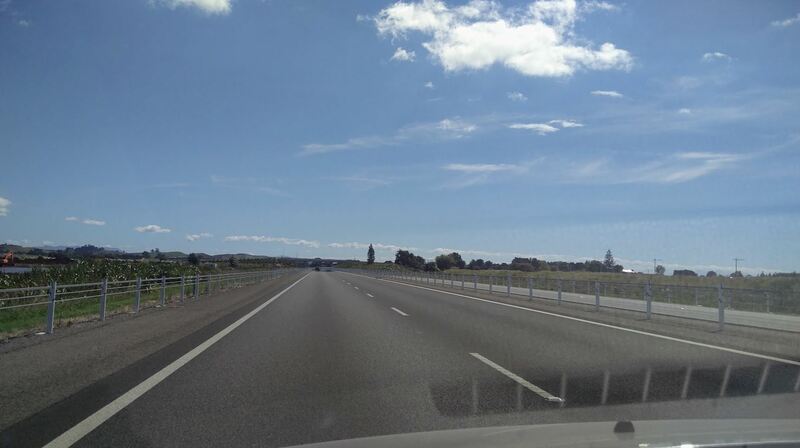 The Waikato Expressway is about 110 km long. Assuming that you drive at the speed limit, raising it from 100 to 110km/h will save you 6 minutes, not 30. BTW, the Waikato Expressway actually had a BCR better than 1, some sections were lower. Also, we do business cases on surgery prioritisation and welfare reform, too. Even if we didn’t, there is a clear difference in that we consider access to healthcare and the food, water and shelter that welfare afford to be a human right. Driving on a four lane expressway isn’t a human right. Jimbo – good for you, you’ll realise some benefits from this project. You also say “Do you really believe we should have goat tracks joining all our cities forever just because no business case can justify anything better?” For my own personal benefit, just like yours, I may be in favour of nice new roads above a goat track to drive on..but is it the best use of the money? $450-odd million? NZTA had prioritised it as 45th..so they didn’t seem to think so. Don’t you think that large amounts of public expenditure should be at least analysed for its most efficient/effective use? As noted by Jezza this could have been spent on the Napier Taupo highway, or on a simple Te Puke bypass which achieves the same result, or any number of projects which had higher priority (either for economic or safety reasons), but instead it gets spunked on RONS. Why shouldn’t our government and public agencies be accountable for their spending of our money? Basically I think the BCRs are so arbitrary (and in most cases rigged) that they aren’t really that useful. – How is there 140 million in benefit in removing the Kirkbride road lights when the traffic will just back up at the next intersection? Should we fix all of Auckland to Wellington to reduce deaths by 80%, or should we build 40 km of 4 lane expressway though? That’s where the BCR comes in. ‘Belief” is the suspension of critical thought: very apt descripition of the (non-) thinking behind these roads. So what would the toll have to be to meet these targets? Especially for freight traffic? And what does NZTA’s Economic Evaluation Manual value 24 minutes time savings as in dollar terms? And are people and freight operators willing to pay this? Are the EEM’s models and figures founded in reality? Isn’t this an opportunity to check? Just maybe all the easy assumptions made by NZTA, MoT, Treasury, and the government about roads and economic value are just a little bung? The fuel savings alone on a smooth road where you are able to maintain a constant speed would be more than the current toll. It seems so many projects are justified on “traffic modelling”, yet years later nobody seems to dig out the predictions and assess as to how accurate they are. Apart from Transport Blog, does anyone dig them out and see how good they were, in order to improve the accuracy of future projects? It seems that the modellers can get away with saying anything as nobody is held accountable for their accuracy years later. I know you can never predict with any certainty, but if they are always very wide of the mark, this should be factored in when making decisions based on such predictions. While I agree it’s probably gold plated and overly expensive, TEL is probably one of the few examples in this country where the government has actually acknowledged that a region is experiencing high growth and has introduced the transport capacity in anticipation of this. As opposed to waiting for the travel times, reliability and safety to become an issue before doing something about it. I’ll add that this blog would be one of the first to whinge about the lack of foresight by the government had the latter occurred. Lose/Lose really. This blog wouldn’t have supported motorway based sprawl out to Te Puke in the first place, so no. I’d argue that they should be anticipating growth and investing in PT from the beginning, rather than feebly trying to retrofit it after the facts of geometry assert themselves and traffic becomes impossible. (Or not trying to retrofit it at all, in the case of Tauranga.) Something like a more modest highway with a bus shoulder able to be converted into a busway when needed. And invest in the rail line so that fewer trucks need to use the roads… except that would upset the truck lobby. Can’t have that. Interesting that it is described as “the best road in NZ”. Yet all that design effort couldn’t produce a roundabout that prevented a spate of crashes from day one – http://www.nzherald.co.nz/bay-of-plenty-times/news/article.cfm?c_id=1503343&objectid=11313815 . And those crashes have continued, e.g. at least three more truck rolls in 2016. Looks to me like a 2 lane bypasss of Te Puke with occasional passing lanes, access control and a central barrier would have achieved most of the benefits at less cost. Bypass roads and multi lane highways are of no use to trucks and tractors accessing farm properties. Fonterra trucks, fertiliser and stock trucks will still have to use the old road network to access the farms that need them. Have a look at the TEL, farm access from that road is not possible. Same goes for the Cambridge and Taupo bypasses and the Waikato expressway. These roads to assist the local economy and take the heavy local rural traffic need to be designed with the help of some experienced rural folk. They are only any good for someone going long distance in a hurry. Spot on. What it really shows is that the freight on that route is not long distance, what was really needed was a bypass of Te Puke just to take the trucks out of the town and some safety improvements on the old SH2. Yes exactly. So this spending is optimised for the long haul trucker. And parallel to an existing rail line. Wouldn’t a rational national strategy prefer long haul goods to utilise the safer, lower carbon already existing rail system over vast road trains. Especially as these then enter cities to get to port, whereas rail has its own route through contested centres. And optimise the road system for efficient local access and freight needs? ‘We need new thinking. Let us think of the motorways as corridors. If we cannot get new road corridors into our cities is there any other corridor? Yes, the rail. Is it possible to increase our use of the rail corridor? Yes. Is Tauranga’s Ghost Motorway and other RoNS an attempt by NZTA/MOT to bypass rail and develop infrastructure for a “post rail” future? The way in which RoNS are being used to lower the long term OPEX of the trucking industry perhaps needs comparison with KiwiRail’s rail freight operation. KiwiRail freight will increasingly carry an operating cost penalty (perhaps $20 million+ per year) due to exclusive use of expensive to maintain DL locomotives in place of lower operating cost electrics and older US built diesels. Good [but expensive] example of how effective Road Pricing can be. Put a “toll” on a road and see the induced demand disappear like the puff of “un-smoke” it is. Clearly whatever the toll is, the users of this road don’t actually value the time savings they make as much as MoT and NZTA traffic models says they do. Or they’d all be driving on the new road in droves ‘cos the time savings “were worth it”. You’d also have to bet that the collection costs of the tolls are eating up a large chunk of the toll revenue, making it even harder for the road to “pay its way”. Longer term, this will only starve other (more worthy) road projects in the future as NZTA start ponying up for the gap between the actual revenue raised and the loan repayments, from the annual road grants from fuel taxes. I suspect this road was all done as an attempted pork barrel by National to try and kick Winston Peters where it hurts [his Tauranga electorate base in this case], and also sounds a lot like what they’re aiming to do now with the HH extension to Northland. If so its an expensive example of putting the politics over the top of all other decisions. And all thanks to Steve Joyce – who’s been the “Donald J Trump” of the South Pacific, for 9 years and counting. At least in the US they get a break from guys like Trump after a few years [at best 4, at worst 8], we have no such “statute of limitation” with Joyce. New Zealanders seem to have a really odd aversion to tolls: I go from Auckland to the Mount a fair bit and Route K is always empty. it’s a 20 minutes shortcut to the Mount and 10 minutes to Papamoa and $1.80 is too much for most to pay by the looks of it. For me the limiting factor is being able to pay the tolls. In case of the northern gateway toll road both the toll booths and the call centre used to be out of order all the time, and entering your bank password on a third-party applet like POLi is something you just don’t do if you want to keep that password a secret. I’ve never had to give my bank password while paying the toll online. Kiwis have no understanding of tolling, I live in Norway now, just to drive from where I live to Oslo, a distance of 400km I’ll pay 200 NZD in toll one way, and the same on the way back. Tolls are a fact of life, if you want to drive you just pay and get on with it. I drove this road during the New Year holiday period, giving my father-in-law a taste of the Bay of Plenty and visiting the ultra cool Tainui Cafe down Whakatane way. It was deserted then as well, technically peak holiday season, so no wonder it can’t pay for itself. Another of the white elephant legacies of the retiring former prime minister. At least he has found a more appropriate calling, leading the blind and disabled to play one of the silliest activities ever dreamed up by an idle mind. The blind leading the blind, as he has been for the past decade. This has more of a look of the hand of Joyce to it, although of course the PM could have overruled it if he really thought it was a waste of money. The talk in Tauranga is certainly why wasn’t the money spent on a similar type motorway heading north out of the city instead? The Tauranga – Auckland route is far busier and requires bypass of towns/areas like Te Puna, Omokoroa, Katikati, Waihi. While this road is in the planning for the future, in hindsight it’s thought it would have been money better spent. Thanks for the link SB. So it looks as though SH2 north of Tga carried more than double the traffic that TEL does currently back in 2011. It is surely a lot busier now with the growth of the city in the last 6 years. That is an appalling waste. That road is as empty as a cycle lane. And 100 times more expensive. The only good road is an empty road. Atleast if you want to win best in show. Be interesting to know how much traffic this road would carry if the toll was removed. $2 is hardly a punitive amount. Perhaps the answer is to toll the old road AS WELL, for all through-traffic. I.e. Charge all traffic passing both an entry- and exit-cordon within say a 1-hour timespan. Thus the only “free” option would be for vehicles taking an hour or more to traverse the old route. Then we would see just what value people place on the much-vaunted time-savings! Very telling analysis Matt L. The mainstream media needs to pick up much-more on this sort of thing. This bypass is a waste of money because you need to go into Te Puke to use the toilet. Currently, TEL is prioritised 45th in the NZTA‘s 2009/2010 State Highway Plan. So there was a good reason for that! Nothing wrong with the prioritisation process then, and telling that no reason was given to bump it up the priority. RoNS is a fig leaf for cabinet ministers picking pet motorway projects, to sideline detached evaluation process. Which is why I have absolutely no respect for Steven Joyce who I understand promoted TEL. He frankly can’t be trusted to act in the best interest of all New Zealanders. I can imagine the howls if nearly half a billion had been spent on public transport infrastructure that had failed to achieve the patronage that this project has. Good story for the Herald to report on. I owe a huge apology to Minister Bridges and Roads. A couple of weeks ago he described the newly proposed section of the holiday highway as a “game changer”. I suggested that the government was changing the game by now investing in hugely wasteful projects. I sincerely apologise for my comment; I had no idea that the government had already changed their focus to invest in extremely wasteful projects and I regret my error. Of relevance is the proposed bayfair to baypark (B2B) extension project. While it may get freight to the port faster during off-peak, I reckon peaks will just worsen congestion at the bottleneck at Hewletts Rd…. However of equal concern is the proposed design for walking and cycling. There was a recent petition down here which called for NZTA not to remove the existing underpass at Bayfair (yes, you heard right). They were proposing to remove the underpass and replace with a crossing at road level, across 9 lanes of traffic I think – madness. Not sure where this got to, but hopefully they are re-considering. The beauty of Tauranga is that most residents support paying a toll too get decent roads built hence TEL being built ahead of schedule. Tauranga is the fastest growing urban location in New Zealand and is a pretty proactive city when it comes to planning for the future. Glen did you not read the post? The toll does not cover the cost of the road. Also I think you’ll find that Auckland is the fastest growning place in the country. And Auckland is desperate to be able to tax itself to build the infrastructure it needs but the government won’t let it, and instead prefers to bring the construction of rural projects like this forward at enormous opportunity cost to better project all over the nation. Tauranga is lovely; but not because of this. Based on the numbers using it, it doesn’t look like they do support paying tolls! Not to mention the Route K debacle that the government has now picked up meaning it is all of NZ’s problem now. The TEL is well ahead of the required useage for the project too have gone ahead. Most trucks heading into New Zealand’s biggest export port use it because of the time it saves. ‘The TEL is well ahead of the required useage for the project too have gone ahead’. Where do you get that from? It is well below forecasted volumes, and even with forecasted volumes it doesn’t look like toll payments were going to keep up with interest let alone principal for quite a long time, so it must have been a very low threshold. ‘Most trucks heading into New Zealand’s biggest export port use it because of the time it saves’. Are you saying the remaining 75 % of trucks that still pass through Te Puke are not destined for the port. If that is the case the port is much less important in the region’s economy than we would be led to believe. It looks like this road might be needed in 30 years, if that’s the case but you want to be proactive then build it in 20 years time. Not sure where your figures come from or have they been read wrong? Transit reports that the use age of the TEL is going very well. The only trucks that don’t use it are service vehicles for Te Puke or Kiwifruit cartage contractors going to pack houses. All of the other heavy traffic going into the city from the South travels on it without question. Methinks you have accurately described this road as a massive subsidy to the trucking industry as they are the only ones that use this road while the old Te Puke road is still chocka all day. Shame the Government doesn’t subsidise rail to the same extent as one train eliminates 15 to 20 trucks off our roads and makes travelling so much safer for us elderly car drivers. 4600 aadt is for ONE DIRECTION ONLY. Aadt for both directions is between 8000 and 9000. Modelled forecast is 8600 for both directions and spot on. Hmm, well spotted. It appears that the NZTA data (plotted above) is for the westbound (“WB”) direction only. The 2015 summary report has a combined AADT in both directions of 7000 veh/day. Nice spotting, it’s odd that they would put only a single direction in the dataset when every other road in there has results for both directions. @Matt L – in light of this information, can you check the data and revise your post accordingly? Matt’s numbers might be wrong but the rest of it is spot on. I have taken your numbers and shown what a fiasco this project was/is. But I am happy to hear your spin on it. No spin, just stating a fact. If he is calling something “wildly inaccurate” based on his own wildly inaccurate analysis then i find the whole argument to be baseless. Readers derserve evidence based analyses and debates. So Matt was wrong on one point. I have re-framed your facts to show that the basic tenant of his article is indeed correct. It appears that you are struggling to refute this and I get that because your numbers tell an ugly story. The first chapter of that story is that the project should never have been brought forward; second if it is a RoNS then it begs the question as to what it is significant for? ; and subsequent chapters should examine how these projects progress further than a cabinet drinks session? Ah but wait, its on Minister Bridges and Roads back door step; probably therein lies the answer. These roads are the life blood of the economy -yeah right. Whatever way you look at it, it is an outstanding result. In fact genius planning! Sadly the government has run out of ideas (at least sensible ones) regarding transport and while all this mindless spending occurs Auckland traffic slowly and inexorably gets slower. On the bright side if this poor level of utilisation meets the criteria to start building the North Shore rail tunnel should be starting any time soon. I drove on the newly-opened Kapiti Expressway this morning about 11 am and as far as I could see there was nothing in front of me, only 1 car behind me, and maybe 5 vehicles going the other way for the entire length of it. There was more traffic (but not much) on SH1 before it and after it, but not on it. Weird (did I miss that I was supposed to have paid a toll?). the real question is who owns all the land at the end of the road? the land that is zoned to be a business park? Congestion has been massively reduced in Te Puke by taking all of the SH traffic out so your travel time on the old route is reduced. The time savings also include the 6km of TEL that you drove on despite going through Te Puke. You’re not comparing the same thing as the NZTA when you do your experiment.